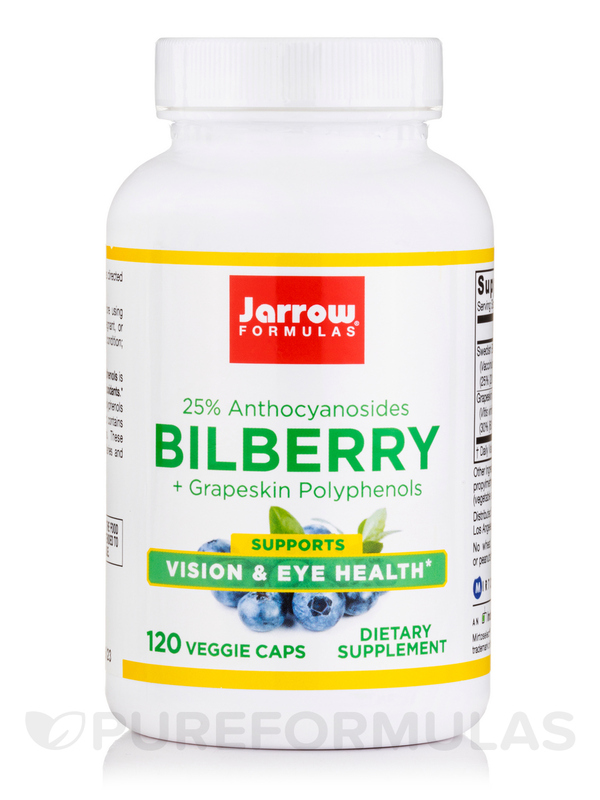 Bilberry + Grapeskin Polyphenols 280 mg 120 Capsules from Jarrow Formulas may support and help maintain healthy vision. These days‚ people of all ages seem to be spending most of their time in front of a computer‚ television‚ or a smart phone. This strain is not healthy for the eyes and can eventually harm the quality of vision. Poor lighting and age are other factors that affect vision. This is where the supplement from Jarrow Formulas might come in handy. Vaccinium myrtillus or the bilberry is similar to blueberries and has been in use for hundreds of years. It was popular among British pilots who seemed to think that the berry enhanced night vision. Excessive exposure to sunlight can increase the free radicals in the eyes and this can damage the retina. 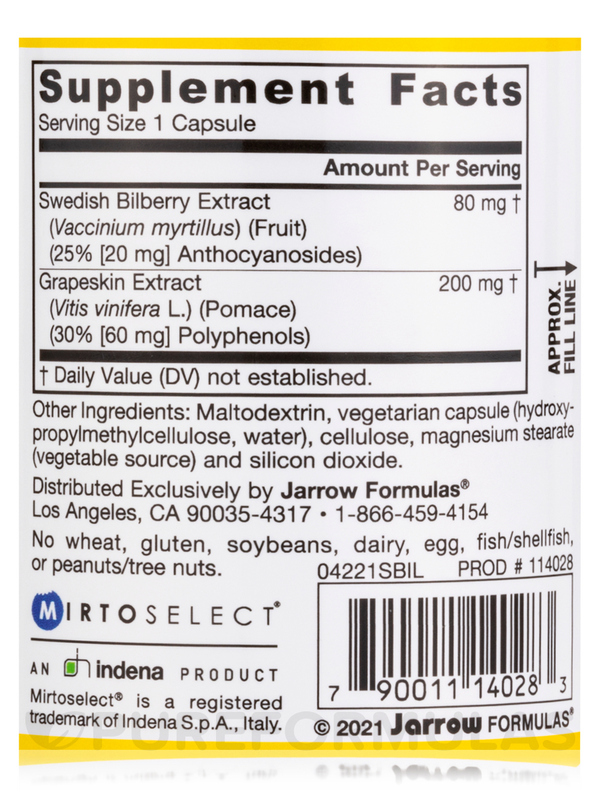 Many studies have shown that bilberries‚ like the ones used in this supplement from Jarrow Formulas (along with a healthy lifestyle) might be useful for maintaining good vision. 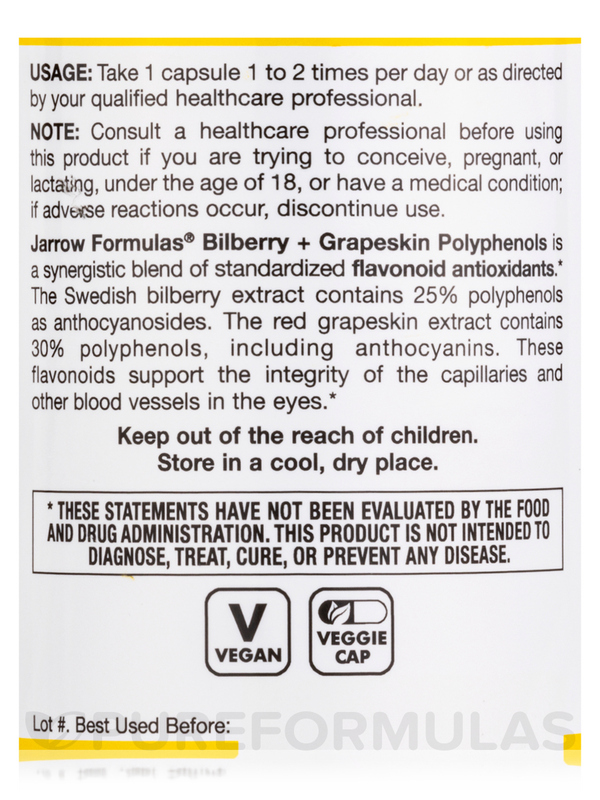 This powerful formula contains a blend of standardized flavonoid antioxidants; both the bilberries and the red grape skin extract contain 25% polyphenols including anthocyanins. 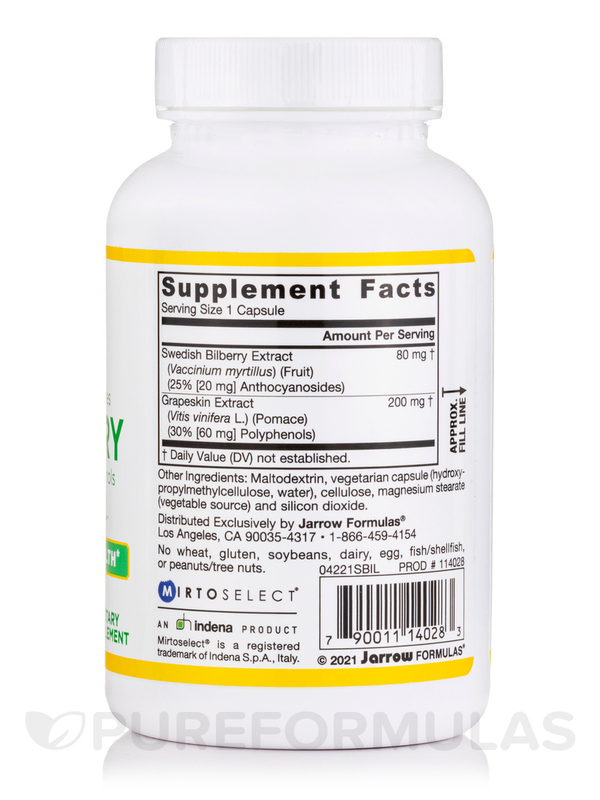 These flavonoids may support healthy vision and reduce the fragility of capillaries. 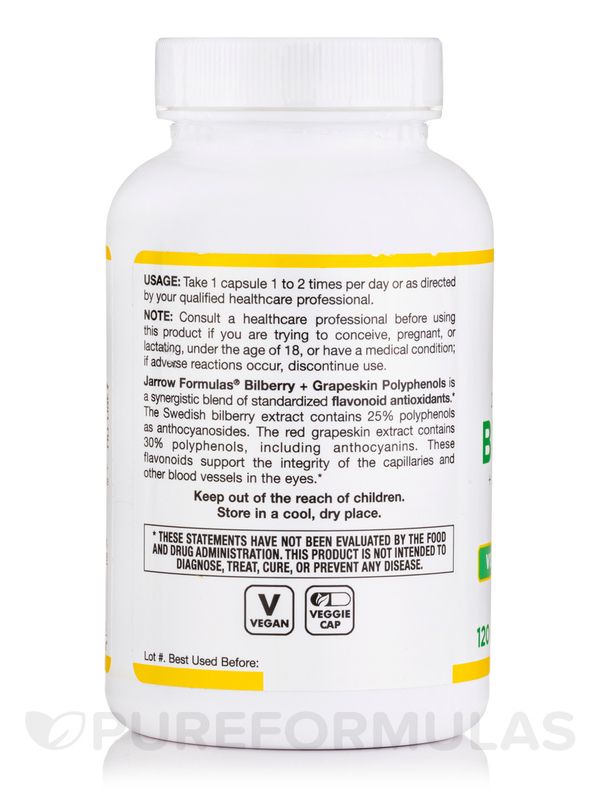 Bilberry + Grapeskin Polyphenols 280 mg 120 Capsules from Jarrow Formulas is suitable for vegetarians and vegans and contains no wheat‚ gluten‚ soybeans‚ dairy‚ eggs‚ fish/shellfish‚ and peanuts/tree nuts. Other Ingredients: Maltodextrin‚ cellulose‚ magnesium stearate (vegetable source) and silicon dioxide. Capsule consists of hydroxypropylmethylcellulose. No wheat‚ gluten‚ soybeans‚ dairy‚ egg‚ fish/shellfish‚ peanuts/tree nuts. If you have a medical condition‚ are pregnant‚ lactating‚ trying to conceive‚ under the age of 18‚ or taking medications‚ consult your healthcare professional before using this product.